3. The Laplace transform converts integro-differential equation in _________ domain. 4. The switch is thrown to position 1. What will be the current in the circuit in the steady state condition ? 5. 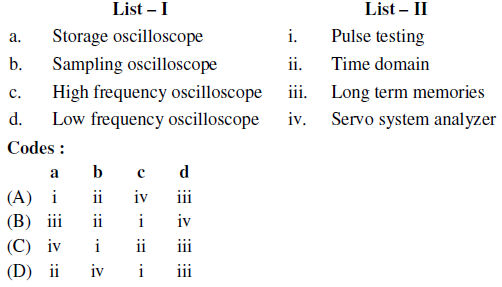 Which of the following oscillations makes use of both positive and negative feedback ? 8. Which flip-flop can be used as latch ? 10. Which flag of 8051 works as 1-bit accumulator ? 11. Which bitwise operator is suitable for turning off a particular bit in a number ? 12. Which storage class is used for the variables that are often required in a program ? 15. 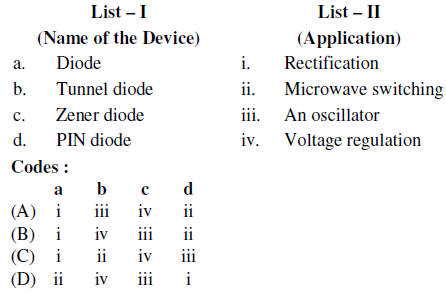 ________ diode is not used as a microwave mixer or detector. 19. In a normal ECG wave form, which wave has the maximum amplitude ? Identify the regions in the above order i, ii and iii. 22. Which is not a proper way of array declaration ? 25. 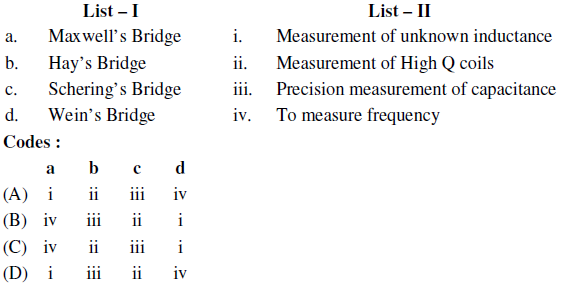 Which of the following sensors has excellent linearity ? 27. 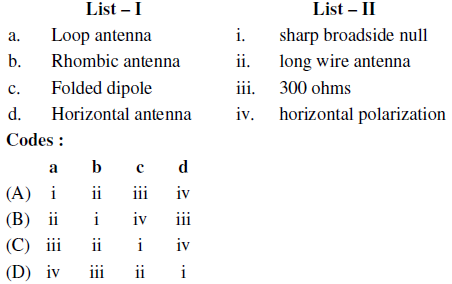 Which of the following digital modulation systems support high bit rate ? What is the modulus of the counter ? 30. An amplifier has open-loop voltage gain of 40.10% of negative feedback is effected. What will be the gain with feedback ? 1. In reverse bias mode the bulk resistance is dominant. 2. The junction impedance is variable. (A) Statements 1 and 2 are correct. (B) Statements 1 and 2 are wrong. (C) Statement 1 is wrong while statement 2 is correct. (D) Statement 1 is correct while statement 2 is wrong. ST 1 : y-parameters can be obtained from Z parameters. ST 2 : It is not necessary to define y-parameters separately. (A) ST 1 is correct, ST 2 is wrong. (B) ST 1 is wrong, ST 2 is correct. (C) ST 1 and ST 2 are wrong. (D) ST 1 and ST 2 are correct. (B) 1, 2 and 4 are correct. (D) 2 & 4 are correct. ST 1 : Queue is provided in 8086. 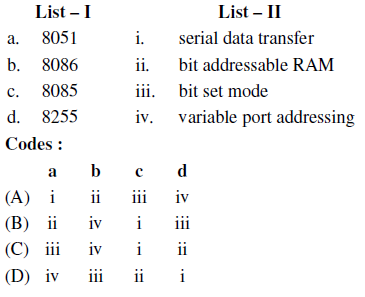 ST 2 : Slow memory does not degrade speed operation of 8086. (A) ST1 and ST2 are wrong. (B) ST1 and ST2 are correct. (C) ST1 is wrong and ST2 is correct. (D) ST1 is correct and ST2 is wrong. 36. Which operators can be used with float ? (A) ST1 is wrong, ST2 is correct. (B) ST1 is correct, ST2 is wrong. (C) ST1 and ST2 are wrong. (D) ST1 and ST2 are correct. 38. 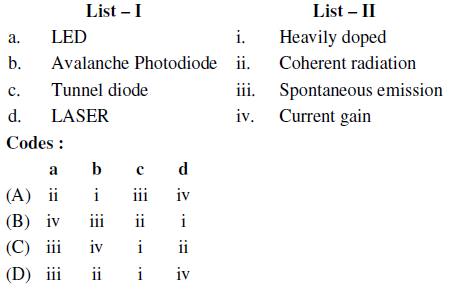 Which of the following are Maxwell equations ? 39. For SCR which statements are correct ? ST1 : SCR should be fired with zero gate current. ST2: failure occurs due to temperature. (C) ST1 is correct and ST2 is wrong. (A) 1, 3 and 4 are correct. 41. Which of the following are useful in comparing the noise performance of receivers ? 42. Which is not the effect of addition of open loop zeroes on the stability of the system ? 1. In semiconductors, the mobility of electrons is more than that of holes. 2. In semiconductors, the resistivity increases with the increase in temperature. 3. Metal has positive TCR. 4. In metals, thermal conductivity is inversely proportional to electronic conductivity at a particular temperature. 44. 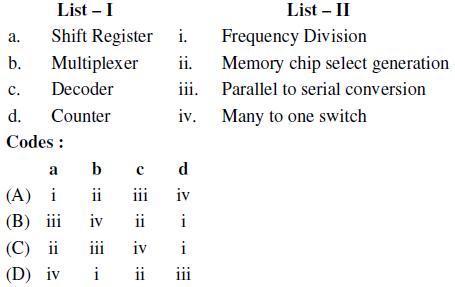 Which of the following circuits will have transients ? ST1 : F.M. signal produces more side bands than A.M.
ST2 : The carrier in a F.M. signal can never be dropped to zero amplitude. Which of the following is valid ? 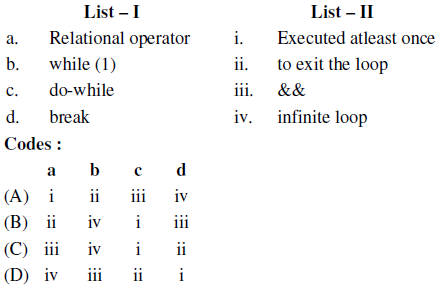 Arrange these in the ascending order of number of clock cycles required to execute them. Directions for questions 61 to 70 : The following items consists of two statements, one labelled the “Assertion (A)” and the other labelled “Reason (R)”. You are to examine the two statements carefully and decide if the Assertion (A) and Reason (R) are individually true and if so, whether the reason is a correct explanation of the Assertion. Select your answer to these items using the codes given below and mark your answer accordingly. 61. Assertion (A) : In avalanche breakdown, the temperature coefficient is positive. Reason (R) : In zener breakdown the temperature coefficient is positive. 62. Assertion (A) : Capacitor input filter gives a high output voltage which drops as the load is increased. Reason (R) : Capacitor input filters produce more heating in the rectifiers. 63. Assertion (A) : Op-Amp is used for sensor circuit. Reason (R) : A small signal amplifier amplify weak measured signals. 64. Assertion (A) : Dual slope (A/D) converter is the most preferred conversion technique employed in most of the digital multimeters. Reason (R) : Dual slope (A/D) converter provides high accuracy while at the same time suppresses the HUM effect on the input signal. 65. Assertion (A) : Any program written for 8080 will run without any changes on 8085. Reason (R) : Any program written for 8086 will run without changes on 8085. 66. Assertion (A) : ‘C’ provides a switch statement. Reason (R) : In order to select one alternative out of many, there is no provision in C. It has to be done by user defined function. 67. Assertion (A) : The system of propagation in waveguide is in accordance with field theory. Reason (R) : The system of propagation in transmission lines is in accordance with circuit theory. 68. Assertion (A) : Amplitude modulation is wastage of power. Reason (R) : Amplitude modulation is wastage of bandwidth. 69. Assertion (A) : A number of thyristors operating in parallel cannot share a common heatsink. Reason (R) : For simultaneous firing of the thyristor opto-isolator may be employed in the gate driving circuit. 70. Assertion (A) : The shift in the position of the bright spot on the CRO screen per unit change of voltage across the deflection plates is called deflection sensitivity. Reason (R) : The path traveled by the spot on a CRO screen during the retrace time is called retrace path. (A) they are applicable to a useful and fairly wide class of networks. (C) they sometimes provide good physical insight into the problems. the extension of Thevenin’s or Norton’s theorem for a number of Current or Voltage sources respectively. The substitution theorem is applicable to any network and can be applied to a branch which is not coupled to other branches of the network. Telleng’s theorem is applicable to any lumped n/w regardless of the type of elements, which may be linear or non-linear, time varying or time invariant. 72. Which equivalent circuits are dual ? (A) Independent voltage sources are open circuited. (B) Independent voltage sources are short circuited. (C) Dependent voltage sources are removed. (D) Current sources are opened. 75. Find out which of the following statements is wrong ? (B) substituting sources by their shunt impedances. 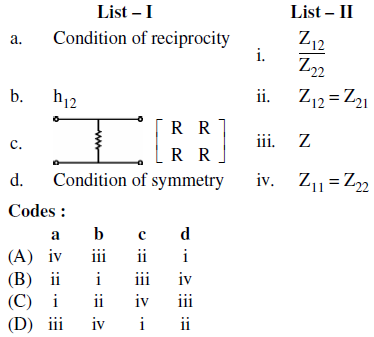 (D) In superposition theorem, response of each source is considered separately.